The classic aluminum Ruben pedal is the perfect balance of form meets function, using the latest.. These aren’t your regular plastics …. Using a harder, more durable Nylon / Fiberglass mix compou..
Lightweight body with a great concave feel and an innovative new pin designmake this pedal the perfe..
Black, Go Go Yellow, Industrial Green Lightweight body with a great concave feel and an innovative .. While staying true to the original Twisted PC’s style, the Twisted PRO offers a significantly larger..
JJ Palmere’s new plastic pedal‘s from Primo are now available! 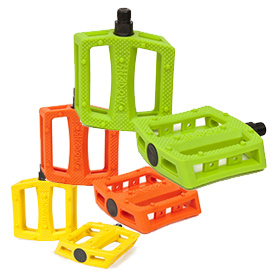 These nylon composite peda..
Primo Stance Pedals designed for grip, great shape.Features:Material: PlasticBearings: UnsealedExtra.. These signature Josh Stricker plastic Pedals have less pins than the classic tenderizers. The new ..
- Josh Stricker signature design- Plastic Clear pedal body- Looseball bearings.. When Connor Keating approached us with this idea we knew instantly that it was something that w..
Nylon/fiberglass body with heat treated 4140 chromoly axle 98mm length x 100mm wide 10 pins per .. The new Rant Shred Pedal offers a wide and stable concave platform, molded from a durable reinforc..
4140 CROMO 9/16 Spindle Custom dual hex head pins Replacement pins includes.. Shadow Conspiracy Nostra Alloy PedalsLightweight alloy, very grippy pedal from The Shadow Conspiracy..
Low profile body with knurling for additional traction Injection molded composite with molded pins..
Low profile body with knurling for additional traction Injection molded composite with molded pins .. The pedal is a key contact point between you and your bike, so we made the new Shadow Surface Pedal ..
Aluminum Josh Stricker signature Looseball..
Aluminum Josh Stricker signature Sealed..
Magnesium Josh Stricker signature Looseball..
Magnesium Josh Stricker signature Sealed.. The Trailmix is the current incarnation of the renowned and much loved JC pedal that quickly became ..